hey mystikal you really know your stuff thanks for all your help. i was just wondering what you think of the jom coilovers and will that drop my 84 318i enough to have a nice stance with the esm 17 x 8.5f and 17 x 10 r. And if so what tires should i run to fill the gap in the fender in the rear. i am currently running the vogtland springs with kyp shocks and 15 inch rims but there is like 2 to 3 inches of gap all around front and back. The least expensive coilovers I recommend for these cars are the BCs. And not just because we sell them, but because it's by far the most complete package and is the only setup to ride comfortably at an absurdly low height. 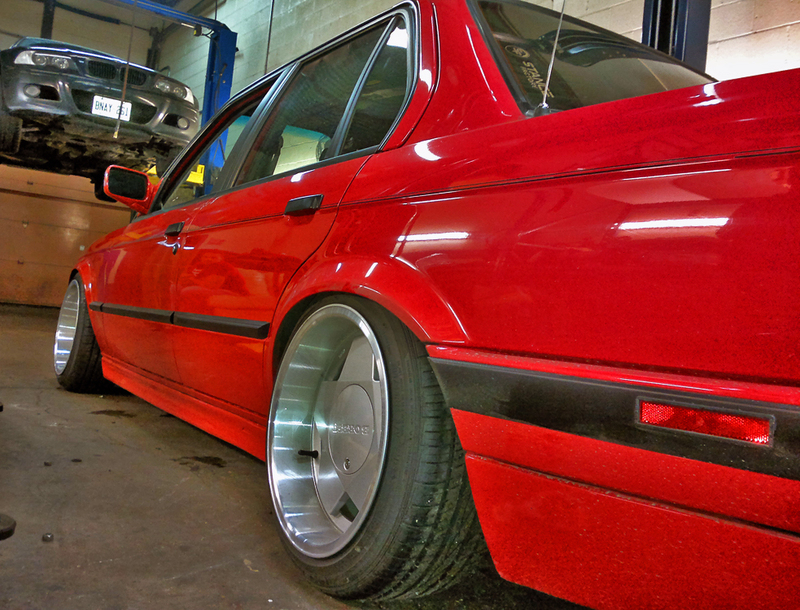 Do the bcs go low enough in the rear though because I have the early model e30 and it's sitting about 3 inches from the tire and I want to close that off as much as I can. How much are the bc coilovers going fr anyways? They can do anything you want as each order is custom built, for us at least. Sweet I just emailed you. Just one other question and I apologize for all the questions I'm just having a hard time figuring this out. You think the 17 inch rims will be to much will the rears have to much poke I want an aggressive stance but don't want it to look like crap. I wouldn't mind going 16 inches either just not sure how wide and everything. I'm most likely going the esm wheels. If you have any suggestions on what wheel and tire setup I should run that would be greatly appreciated. Thanks for all the help! I'd need to know the width and offset of the ESM wheels to give you tire advice. DIRT is for racing, Pavement is for getting there. The only way to turn left, is to turn the wheel RIGHT!! Locked Your DIff and hate it? Give me a shout, will buy em up cheap, DIRT tracks are the ONLY place for a welded diff!! The rims are 17x8.5 offset 20 and 17x 10 offset 15 thanks for your help and let me know if you got my email about the Bc coilovers. Brake clearance has nothing to do with backspacing. You'll have to ask them for a template or measurements or something. The rears are EXTREMELY aggressive. I'd suggest 17x8.5 all around with a 5mm rear spacer instead. 205/40/17 tires. sweet thanks for the help i emailed you about the coilovers let me know if you got it yet thanks. sorry for so many questions i really dont know anything about wheel setups and how this all works trying to get familiar with it though so i dont have to ask all the time but how would a 16x 8 front 20 offset and 16 x 9 rear 15 offset fit witht he bc coilovers would the wheel well fill up nice and would i still use gthe 205/40 /16? thanks again for all your help. sorry, what I meant was, would a 13" rim fit the car without locking onto the brake drums or calipers, and spin freely, clearing the brakes. Yes that setup will work fine. 205/45 is the preferred tire size. Ah, no it will not without grinding down the calipers.